"IUG is at the forefront of the academic institutions which are participating in the Erasmus+ programs. We cherish our relation with IUG, for its apparent activity in seven projects within Erasmus+", said Dr. Nedal Jayousi during his visit to IUG. 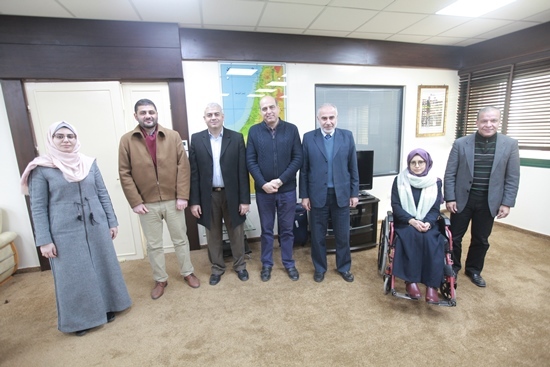 The head of the Erasmus+ national office in Palestine Dr. Nedal Jayyousi celebrated the university's prosperity in the field of International Academic Mobility projects and the great value of being immersed in a new academic and cultural experience. The President of the Islamic University Prof. Nasser Farahat highly appreciated the existence of the head of Erasmus+ national office at IUG. Our president did also value the EU tireless efforts in supporting the higher education intuitions' work in Palestine, noting that EU updated scheme of mobility projects help fill the gap among educational intuitions inside and outside Palestine. "IUG Participation in Erasmus+ Projects is an extreme confirmation on the great significance of partnerships as opening doors into new cultures, experiences, and skills that could raise the performance of higher education institutions", the IUG President mentioned.